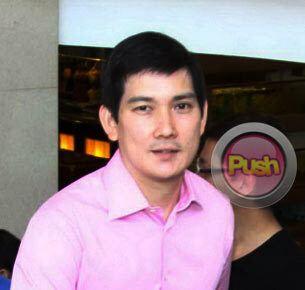 Commercial model turned actor Richard Yap says he is happy to be on the Kapamilya network. After the successful premiere broadcast of My Binondo Girl last Monday, August 22, viewers got to see the acting debut of Fil-Chi commercial model Richard Yap who plays Chen Sy, Kim Chiu’s father in the series. Richard, is also from Cebu and speaks fluent Visayan, which is another reason why he and Kim get along well on and off the set. Before joining the cast of My Binondo Girl, Richard had appeared mostly in commercials of a popular Chinese fast food franchise and a telephone company since 2003. The 44-year-old father of two admitted that the thought of showbiz had never entered his mind until he was invited to come in for an audition for My Binondo Girl. “Actually I never thought about it. Parang ngayon lang kasi an opportunity came along pero never before na nag-isip ako na papasok ako dito,” he admitted. Richard said even on their first working day, working with veteran actors like Ai-Ai De las Alas and Cherry Pie Picache put some pressure on him to deliver his lines well. “Medyo pressured ako a little kasi I know I’m working with very good actresses and actors in this story. Pero lahat sila very supportive. Especially si Direk Malu Sevilla at Direk Francis Pasion, they’ve been teaching me along the way and it’s been getting a little bit easier every day with all their guidance,” he shared with Push.com.ph. Richard said that he enjoys playing the role of Kim’s father because the My Binondo Girl star is very easy to get along with and is a good actress. “Kim is a very nice person, very down-to-earth. Mabait talaga siya and mabilis kami nagkasundo talaga kasi we’re both from Cebu and we’re both Chinese. She’s very easy to get along with, mabait talaga na tao,” he stressed. Richard also gets help from Cherry Pie Picache, who plays his scheming wife in the drama-comedy series. “Siyempre in real life, the characters we play are very different from our real personalities. Si Ms. Pie naman, she’s also very supportive. Mabait siya, makuwento siya and she helps me out talaga with my scenes. Pag meron akong hindi masyado alam, sasabihin niya, ‘O eto dapat gawin mo,’ so tinuturuan din niya ako,” he said. Even before joining My Binondo Girl, Richard was already a fan of the Kapamilya network and has watched series like Tayong Dalawa and various koreanovelas. He is also thankful that he has not had to let go of his regular job at a marketing company in Cebu. “Hindi ko pa naman kailangan mag-leave kasi hindi naman everyday yung shoot,” he shared with Push.com.ph.